* I received free product to help facilitate this review. All opinions expressed in this post are 100% my own. 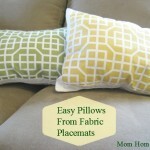 If you’re a reader of this blog, you must know that I love pillows! 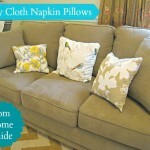 I’ve made DIY placemat pillows and pillows out of cloth napkins for my home’s living room. So I was excited to try out the Paint a Pillow kits from Paint-A-Pillow. I have never stenciled a pillow before and thought it would be fun! I picked out the Mermaid Paint-a-Pillow kit — I love the pattern! The kit came with everything I needed to stencil a pillow: a stenciling frame, a reusable pillow stencil, a 17”x 17” cotton pillow cover, a pillow insert: linen/down alternative, a mini roller and 1/2″ stencil brush, a paint tray and stirring stick, a free mini stencil and practice fabric swatch, full color instructions, and one fabric paint of my choice. Besides my kit, I also received a second paint color, some tassels and some antique silver round cone studs. My Paint a Pillow work area. 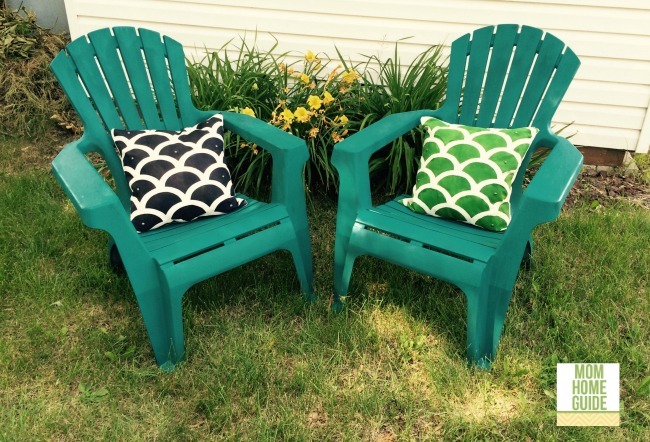 My DIY stenciled pillows were fun and easy to make! My stencil frame came with a pillow cover already inserted, so all I had to do was choose my work area — so I chose to paint outside on a small folding table. (I figure I could skip the clean up if I painted outside!) I laid some newspaper on top of my folding table and placed my stencil frame and pillow cover on top of the table and got to work! I squirted some fabric paint on my paint tray, and rolled my mini roller until it was covered with paint, but not too saturated. 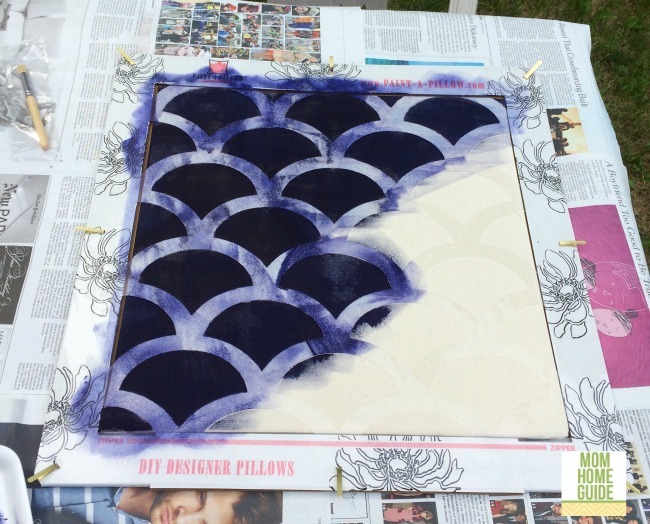 I then simply rolled the paint over my stencil and pillow cover until I had completely filled in the stencil design! 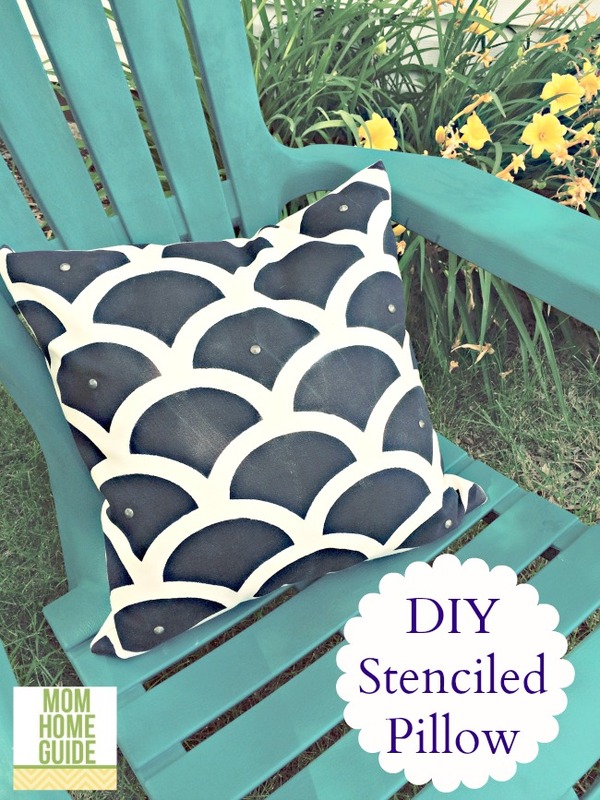 I let my DIY stenciled pillow cover sit outside for an hour or so to make sure it was completely dry. Once it was dry, I simply snapped on my antique silver round cone studs! 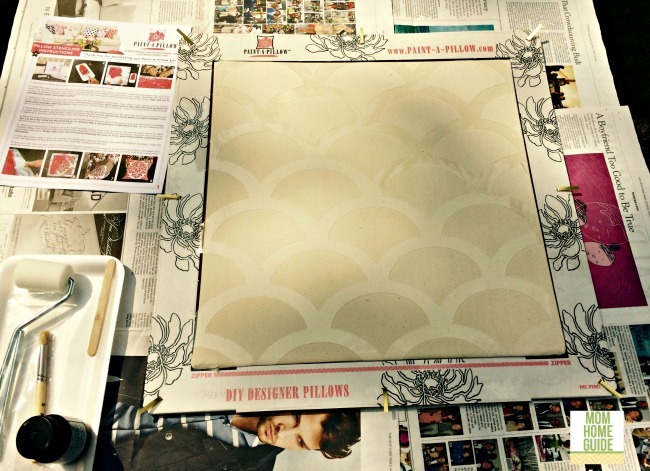 I then put my pillow insert into my stenciled pillow cover, and my pillow was complete! For my second pillow, I wash and dried my stencil (in the sink), inserted it and my pillow cover into my stencil frame and repeated the same process for my second pillow! 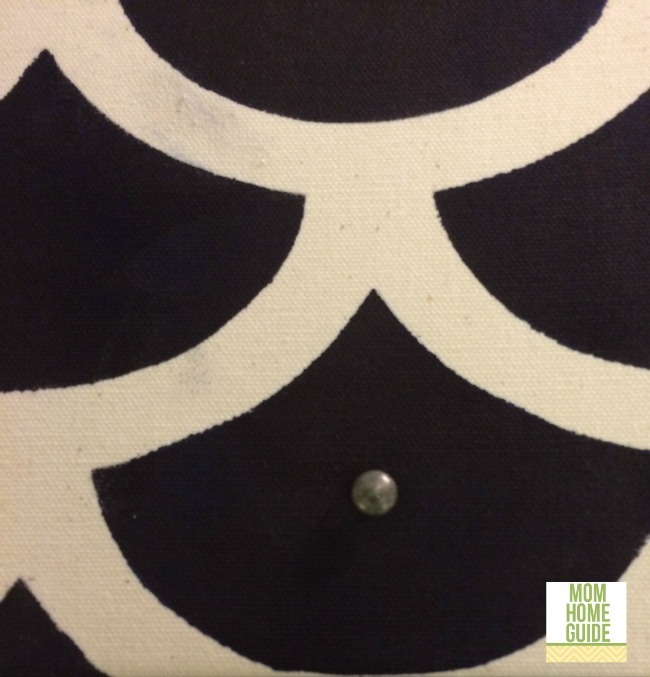 The below is a close up shot of one of my DIY stenciled pillows. I love how my stenciled pillows came out! 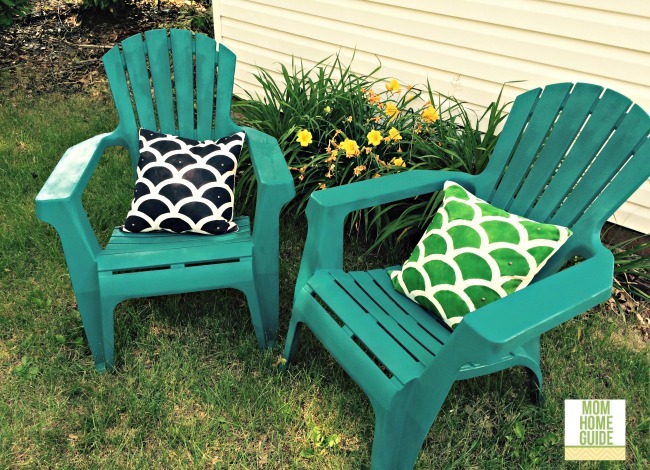 I think they look great on my spray-painted Adirondack chairs! This is another look at the pillows — this was a fun project! Good news, readers! Paint-A-Pillow will give away one Paint-A-Pillow kit to one reader, who will be chosen at random. To enter, follow the directions in the Rafflecopter widget below! 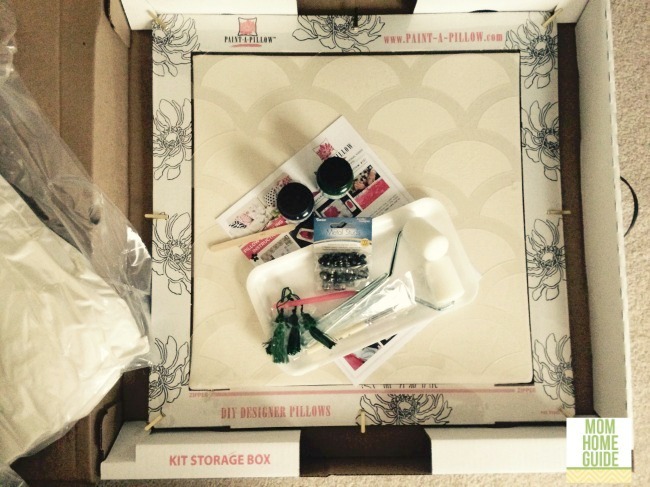 *The Paint-A-Pillow kit will be provided to one reader chosen at random through Rafflecopter. The sponsor of this post, and not Mom Home Guide, is responsible for the fulfillment of this prize. Thanks so much, Monique! Glad you stopped by! I agree, Meg! I LOVE throw pillows! 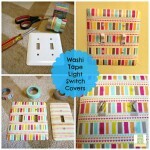 This looks so cute and easy to make. I’m new to DIY accent pillows but excited to start! Hope you get to work on some DIY pillows, Mina! Thanks so much for chance to win. Looks like fun. Hi, JaneEllen! 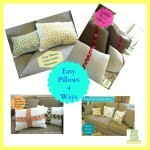 It is great being able to make one’s own pillows. 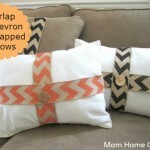 I completed my pillows using a kit from PaintaPillow.com.